How lucky am I? As a feminist theater director, I seek out plays written by women about women. They are, statistically speaking, more likely to be feminist and on the whole they provide more opportunities for women actors. But one of the benefits of having an established reputation for doing a certain kind of theater is that when producers I know read plays that deal with women’s issues, they think of me. 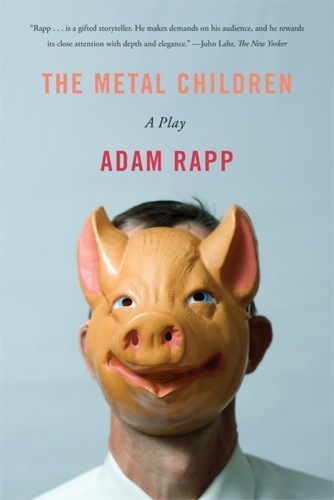 I directed a gender-confused Twelfth Night at the University of California at Riverside in 2011, so when they contacted me about doing Adam Rapp’s The Metal Children and I read it, I thought, “Awesome. They get what I do.” Little did I know. At first I connected to the play primarily on the basis of it’s frank discussion of abortion, it’s illumination of the troubling valorization of teenage mothers that has necessarily resulted from the Bristol Palin debacle, it’s recognition that total reproductive autonomy for women necessarily calls into question the role of men in reproduction and fatherhood, and it’s stylistic representation of these issues through the tortured point of view of the artist. It wasn’t until we began rehearsal that I was forced to confront the fact that the play is also about an writer suffering an identity and creative crisis as a result of his divorce. Ha. Whereas I often choose material that is foreign to me because I love an excuse to do research, this time I have been hired to direct a play that I feel, more than ever before, is about me. How to deal with that while also providing undergraduates with an experience to make something that is about them? Aesthetic distance, of course: an Expressionist concept that makes use of the fact that the story is told from the point of view of the main character and his creator, Adam Rapp. The play is essentially an expression of a very personal worldview: One forged in pain, confusion, and fear, and one which leads us back to the central issue of abortion. Of all the plays by women and about women that I have directed before, no other play has given me the opportunity to do feminism in the classroom that this play has given me. Not only do I have to, as a director, make the personal political (in other words use my personal experience to tell a universal story), I actually have to make sure the students understand the difference between medical abortion and surgical abortion, the difference between vacuum aspiration and dilation and extraction, and the rare and yet over-represented-in-the-imagery details behind intact dilation and extraction or late-term abortion. And it’s not just that I have a chance to clarify the facts on these issues. I assigned a student dramaturg the task of researching those facts and differences and explaining them to her colleagues, and what did she, after a Google search for “side effects of abortion” come in with? Articles from http://www.lifenews.com. I don’t blame her for it. In fact she accidentally made for me the point of the play: Accurate information on abortion is hard to find, and extreme emotions on the subject tend to be inspired by extreme ideas about what it entails. As a result of this, I asked all of the students to compare the information on Life News (an anti-choice site) with the information available from Planned Parenthood (a pro-choice site) with the info on WebMD (a presumably neutral source of medical information). In a few days, the student dramaturg will present the points of view of pro-“men’s rights” group and anti-“men’s rights” groups as well as the positions of men and women genuinely interested in addressing the effect of reproductive legislation on both women and men. Again, this is not an opportunist exercise. Rapp actually cites a particular abortion apparatus by name: the SU-507 180-watt Crown Suction Unit. To act a line that includes a reference to that, the student must know what it is. But the opportunities as well as the dangers of this are evident: I do not wish to impose my point of view on anyone, but rather hope to engage them in a discussion of the issue based on a clear understanding of the facts. Likewise I do not wish to make the show about my particular grief upon the end of a marriage, though I share many experiences with the main character and the author. These precipices are dangerous but they are necessary, it seems to me, to the practice of feminism in the classroom. Despite the misconceptions of Fox News and their fellow travelers, it is not the goal of feminism in academia to persuade people to our point of view. It is our goal to educate citizens about the facts and to teach them to think critically about any and all information they may encounter. That I get to do this while also directing a play about an archetype of me, starring some outstanding students who are invested in the liberal arts’ goal of connecting fields of study through the act of critical thinking, is lucky for me indeed. The Metal Children will run at the University of California at Riverside from November 8 – November 17. When I’m asked to describe my work as a theater director (as anyone in this field is often asked to do), I make sure I use a few keywords: Viewpoints and Composition, gender, Epic Theater, performance of identity. When talking to artists with whom I collaborate, I sometimes say post-modern, and then I explain what I in particular mean by that. There are other isms and ists. Feminist. Post-colonialist. I also use reconstruction instead of deconstruction. And I invoke Brecht, namely in the context of narrative (as opposed to plot) and history. So it’s always interesting to go back to those sources and take a fresh look at what I actually do versus what the theory that inspires me asks me to do. I’m working on two unrelated productions at once right now – As Long as Fear Can Turn to Wrath and Rimers of Eldritch – and with both I have invoked “historicization” as a design and performance aesthetic. But what do I mean by that? [Scenes] must be portrayed as emphatically and significantly as any well-known historical episodes, though without sentimentalizing them. In this epic theatre serving a non-Aristotelian type of drama the actor will at the same time do all he can to make himself observed standing between the spectator and the event. 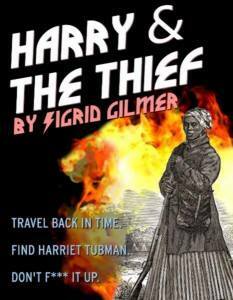 The epic theater is chiefly interested in the attitudes which people adopt toward one another, wherever they are socio-historically significant (typical). … The concern of the epic theater is thus eminently practical. Human behavior is shown as alterable; man himself as dependent on certain political and economic factors and at the same time as capable of altering them. I’ll be honest. I often choose historical subjects for productions simply because I think history is really interesting. I like having an excuse to learn as much as I can about a particular period – to devour the music, the images, the words and sounds of an age. But I also chose to adapt Steinbeck’s Grapes of Wrath partly because its historical material so perfectly speaks to our current economic concerns. (Also partly because it’s brilliant and beautiful and the things he does with words are wow.) Part of my point is that we can learn from the ways history repeats itself – we can see ourselves in the past and understand that we can’t keep making the same mistakes. When we see how history repeats itself, surely we will realize that we have to change, or so my thinking goes. The actor must play the incidents as historical ones. 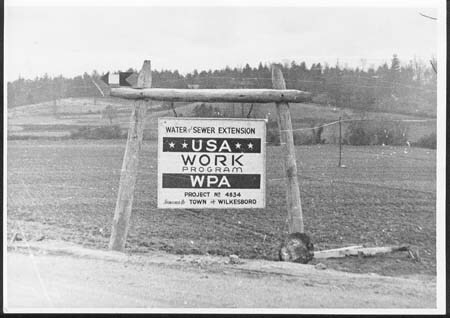 Historical incidents are unique, transitory incidents associated with particular periods. The conduct of persons involved in them is not fixed and ‘universally human’; it includes elements that have been or may be overtaken by the course of history, and is subject to criticism from the immediately following period’s point of view. The conduct of those born before us is alienated from us by an incessant evolution. So whereas I want to use the way that things don’t change to convince the audience that we must change, Brecht wanted to reinforce change by showing all the changes we’ve already made. The endpoint, I would argue, is the same: to get the audience to think critically about the ways we behave. But the means are actually pretty different. Now, if you’re still with me, you have either have some preexisting interest in me or in Brecht, so bear with me a little longer, because what’s fun is how these things manifest in rehearsal. For As Long as Fear Can Turn to Wrath, it’s in 4 ways in various combinations: what is historical, what is Steinbeck, what makes our political point, and what is good theater. Two examples: the women actors in the show play both Women characters and a Used Car Salesman, a Truck Driver, and a Manager. 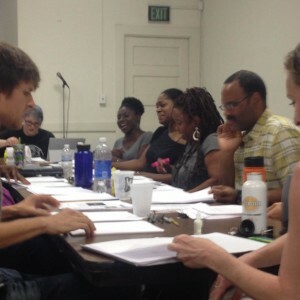 They do not have time to change costumes (we can’t afford more than one costume per actor anyway), and the question came up of whether they should wear dresses. The dresses would be historically accurate when they are First, Second and Third Woman, but not as the other characters. So the question becomes what will the audience believe (“believe” in the sense of “be able to make meaning out of”), and the answer is they are more likely to believe Women in pants than Truck Drivers in dresses. So then the question becomes do I want to challenge what the audience believes? Sometimes I do, sometimes I don’t. In this case, the gender of the characters is not the main point I’m making, so I’m not interested in defying the audience’s expectations with that particular choice. But in making these sorts of choices, am I in fact perverting history? Am I encouraging people to believe in a falsehood? Am I “Oliver Stone-ing” the Okies? This is a work in progress, but right now, I’m thinking no. And here’s why. My work is Brechtian. I’m not actually trying to convince the audience that women wore pants in 1935. Nor am I suggesting that they actually had social or economic power. I’m actually assuming people know the truth on both scores, and that they know that this is theater and therefore a fiction. And I am hoping that in seeing real women with their own thoughts and motivations living in 1935 circumstances, we can get closer to understanding how absurd assumptions about gender are in all times. Or maybe my work isn’t actually Brechtian at all. Either way I’ll leave you with this: Women always have been and always will be fully human subjects of history. How we document that, as far as I can tell, has always been pretty much up for grabs.